Welcome to the Summit House Press Website. Summit House Press is a full-equipped printmaking studio on Pumpkin Hill Road in Warner, NH, owned and run by Mary Mead. 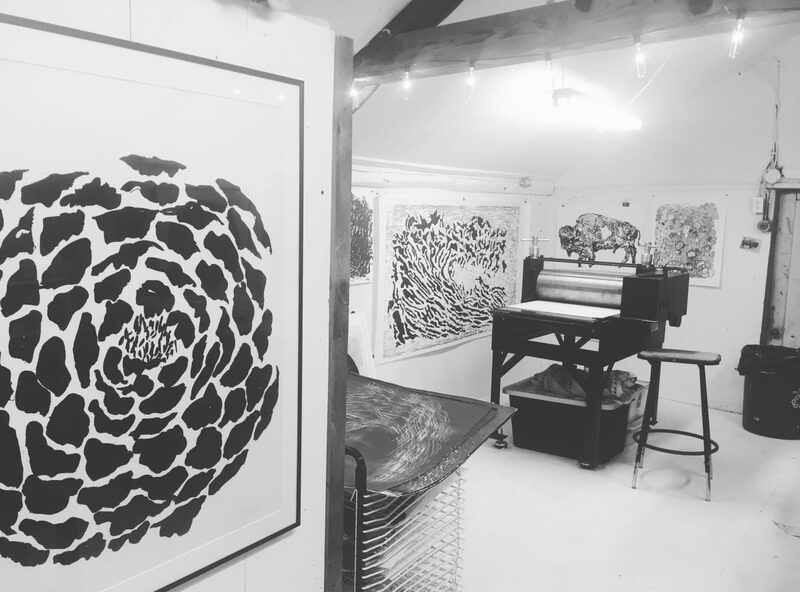 We offer individual and small-group instruction in a variety of printmaking processes, options for collaborative projects and small editioning services. Mead has worked primarily in printmaking over the past seventeen years. A former assistant professor at Colby-Sawyer College (New London, NH), she currently teaches printmaking at the New Hampshire Art Institute (Manchester, NH), and at a variety of venues in New England including Chases Garage (York, ME), AVA Gallery and Art Center, (Lebanon, NH) Two Rivers Printmaking Studio (White River Jct. VT), and the Kimball Jenkins School of Art (Concord, NH). Set among gardens in the summer and surrounded by forest all year near a network of nordic ski trails, Summit House Press offers a beautiful, quiet and creative environment in which to learn a printmaking technique or complete a printmaking project. Warner, NH is located just 90 miles north of Boston, 20 mins north of Concord on Route 89. Warner is home to summer music festivals, a seasonal farmer’s market, the Tory Hill Readers Series, a variety of museums (Indian, Telephone, Nature, Historical). There are several restaurants including a pub called The Local, (with 45 beers) and Schoodacs Coffee and Tea, with a large southern porch and live music Sunday afternoons. The newest venue in own, The Warner Public Market offers creative weekend afternoon workshops of all kinds along with fresh produce, bread and a variety of food and craft items. The independent bookstore in town, Mainstreet Bookends, is legend for it’s authors series throughout the year, concerts, book and toy inventory and art gallery. Warner is home to many writers, musicians, craftsmen and women, and visual artists and is a wonderful place to live and visit. The original Summit House, long neglected it once stood at the summit of my dad’s 2 ‘ narrow gauge steam railway in our backyard. Pronto Plate Lithography is a technique you will want to have in your arsenal, as it can reproduce a variety of images both hand-drawn and painterly, or photo-based. Pronto plates operate on the antipathy between oil and water, are fairly simple to master, and relatively inexpensive. In this printmaking workshop you will learn how to create images using simple materials such as ball point pen, acrylic floor wax, sharpie, crayon, and if desired, laser copies of photo-based imagery. The plates can be cut and/or layered to create multi-colored prints. This is a great class for beginners and professional artists alike interested in learning a new and extremely versatile technique. Participants should expect to create a portfolio of completed prints. In this workshop, we will explore a variety of approaches to creating monoprints – prints based on an underlying matrix that can be printed in multiple different ways, and monotypes, completely unique prints. Both are often referred to as “painterly” prints because they frequently defy the strict technical rules that govern many printmaking processes. Learn to employ transparent and extender base for important in layering. Depending on time and focus we might add screen printing with water-based media as an add-on. Come prepared to experiment! Since I have neglected to rebuild a new site since closing the old one – that now appears to be a Chinese take-out menu – I have updated a long lost temporary website. Hopefully this one will also be temporary! Summit House Press Blog at WordPress.com.